We’re very excited to unveil our new range of stylish online family tree charts and features – check them out in the ‘Charts and Books’ section on your family site! 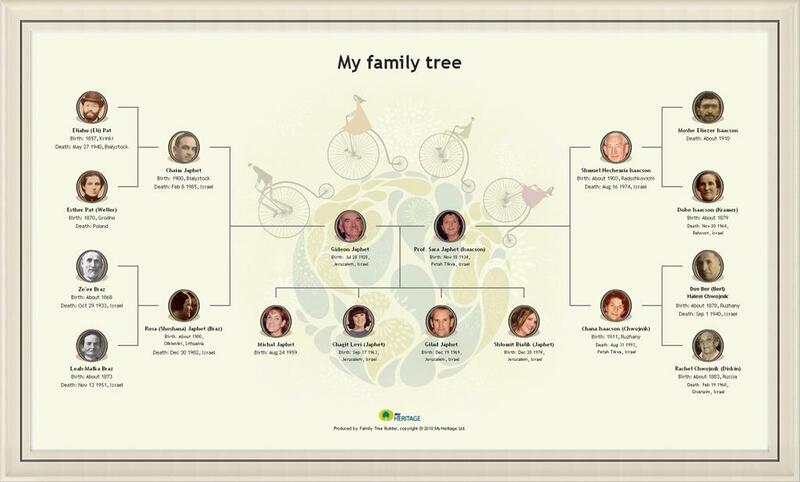 Create a beautiful family tree chart in only a few clicks and share it with family and friends for free. We’ve also launched a new professional poster printing service – an ideal gift for the upcoming holidays. New Chart Types and Styles – More chart formats are now available, such as the Bowtie and Hourglass formats. 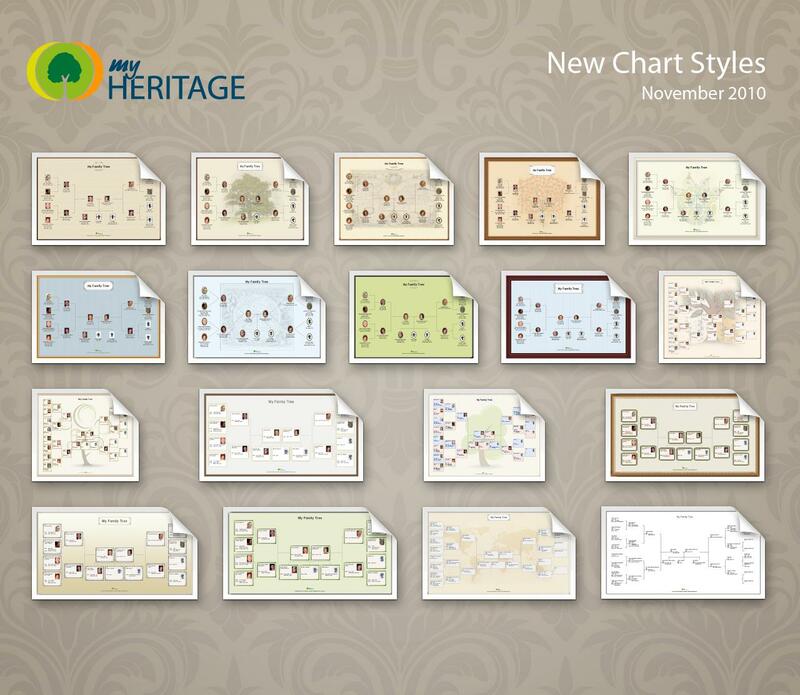 You can choose from 18 enticing chart styles that will beautifully present your family tree. Or personalize your chart by handpicking from the many background images, fonts, color schemes, photo frames, border decorations and titles available. Further customize your chart by selecting the information to be displayed such as names, birthdates, wedding anniversaries, personal photos, notes, and other biographical data. Save as a PDF document and share with family and friends via email. Professional Poster Printing Option – Order a poster of your family tree and with international shipping, have your chart delivered anywhere in the world. Prints can be ordered in a variety of paper types (including standard paper, matt photo, glossy photo, vinyl and canvas), in almost any size and with optional lamination. 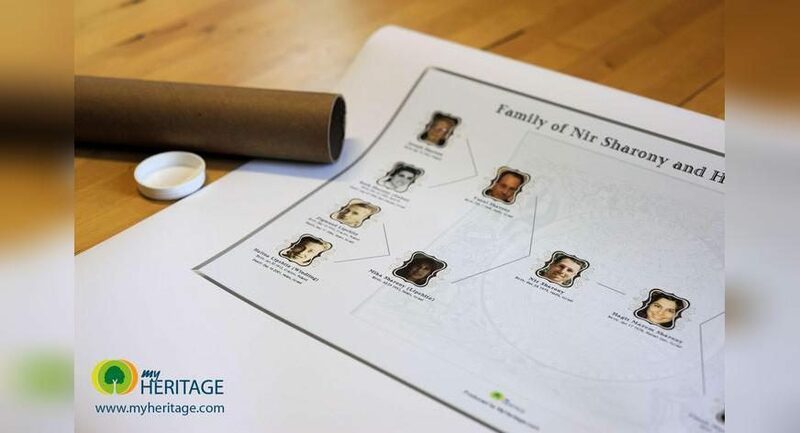 With our new chart features, designing and printing your family tree chart is easy, simply choose from one of the stunning family tree chart designs now on MyHeritage.com. 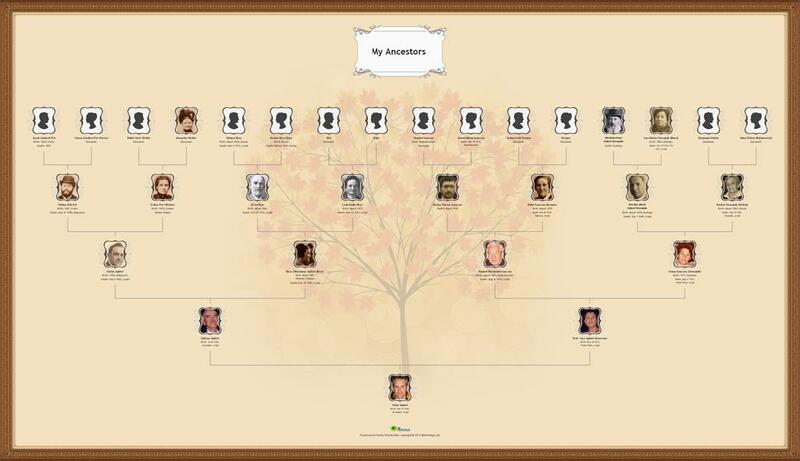 Check out our new features and start personalizing your family tree chart today! All the styles, formats and unlimited chart generation is free, so you are more than welcome to create as many charts as you need. Stay tuned for a follow-up blog post (now available here) on how to create and customize your own stunning chart. PS. Click here to read our news announcement on the new charts and posters. Have too many names in my tree and was looking for a way to delete some so I can make a chart. Any suggestions? I’ve created a tree with almost 900 names because I’ve done expanded branches for everyone who married into the family. I know this is too much for one chart, but I would love to capture it on a CD if possible, (no photos), to share with others. Is this possible?? Does this most recent new version work on Apple (Mac) computers now? @Marty, if you’re able to get your chart in a pdf file, burning it to disc should be straightforward. How this is done, however, depends on your computer’s setup and the disk burning software you’re using – which should contain instructions. @william, there is no time limit on this feature. If you want to create a chart next year that’s no problem. Step 3 should take you to this stage. This is something I would like my son Michael Jonathan Moffatt to do for us while in our home using our resources to get the job done. Thank you very march for interesting material. Can I import my family history from Family Tree Maker 2006..I have over 500 names and several pics??>? I would like to print 8×11″ 3 (three) generation charts off of my family tree- any chance of that? It is wonderfull living history to keep ancestorial lineage in prompt .A great experience to share with our blood. I WOULD LOVE TO SEARCH FOR ANY ROBERTSON PEOPLE ONLINE! BOTH MY PARENTS HAVE PASSED. MY MOM DIED IN SEPT 2002. Hi my name is Dave Copeman and I would love to here from any Copemans out there , My father was Horase Trever Copeman ,he was born if Whales England ,his dad was James, he had 1 brother Charle, and 2 sisters. If any body new them ,or of the family I would love to no more about my ancesters, and there past. My dads , dad remarrier, and I would like to talk to them. We have almost completed my partner’s family tree thank you to My Heritage.com as well as other sourses and went as far as beggining 19th Century. I was born in 1965 in Russia, Kirovskaya Olasty, Darovskoy District and would love to have my own one but found dificulty to get information. Could not get any information about my dad and his side from my mum and auntie and just a little about my mother’s mum side, would very grateful for any infomation or direction. how can i order a poster of my tree? i really want to have this, if i print it out on my homeprinter it will be in 45 different papers.. i want it all in ONE poster…. 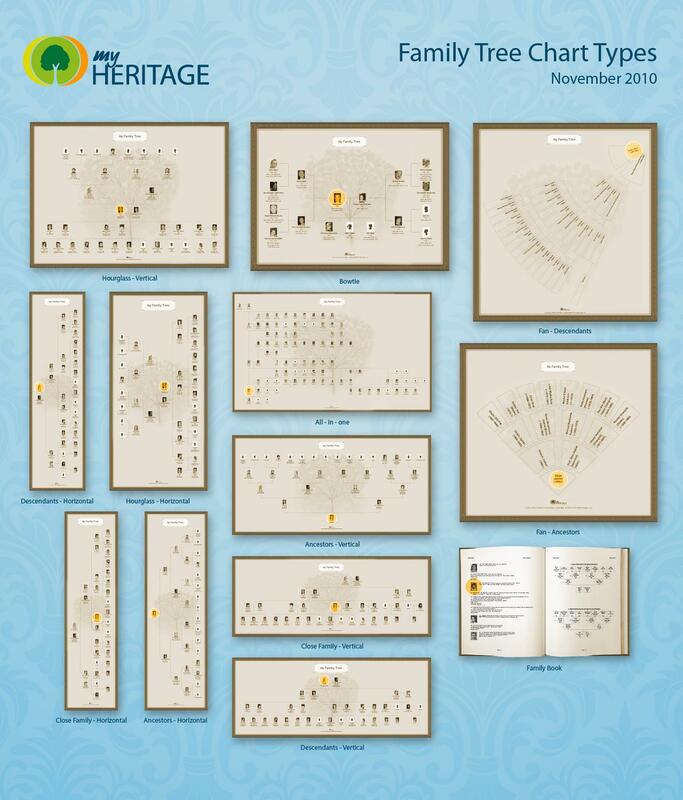 i went to my diagrams but nowhere can it be read that i can order a poster of it..
Hi Siv, you can find instructions of how to do it here: https://blog.myheritage.com/2010/11/part-two-a-guide-to-creating-family-tree-charts/ . You can also email support@myheritage.com for more help. hoping to create a small family tree to print out as a wedding present for my daughter. Is this the right place to do it? Thanks for your comment. To print a MyHeritage family tree, you first need to sign up (for free) at http://www.myheritage.com. Once you’ve created your family tree, you’ll see the options to print it. Please let me know if you’d like any more information. 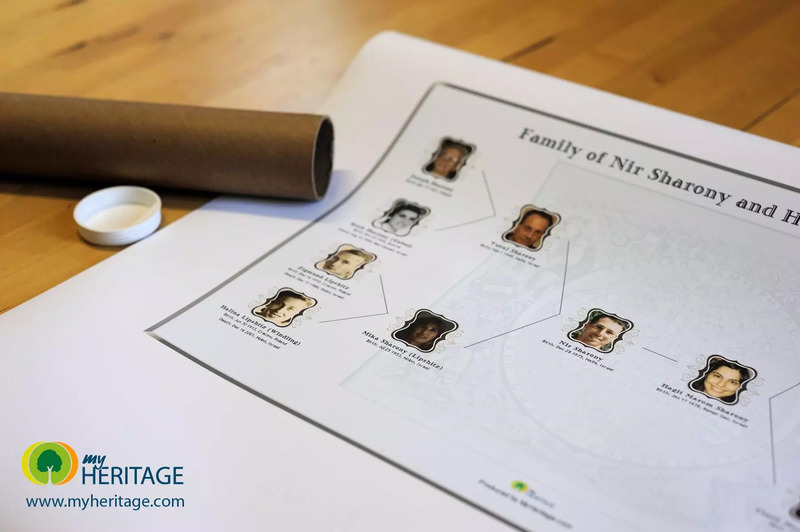 My family here in NZ are so grateful to MyHeritage for enabling me to create beautiful charts for them & they give them pride of place in their homes. One daughter has it so you see it as soon as you walk in her front door,- many impressed visitors! I would like to give it a go.